Budget leather gloves with carbon knuckle armour, ideal for sportsbike riders! Protection on a budget! These leather motorcycle gloves are the ideal choice for those sport riders that are on a budget. They come in a variety of colours to suit your colour scheme and offer a carbon knuckle and leather construction for protection. 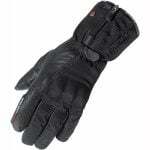 Ideal for summer riding: These gloves have ventilation at the cuffs and fingers to ensure airflow on those summer days.